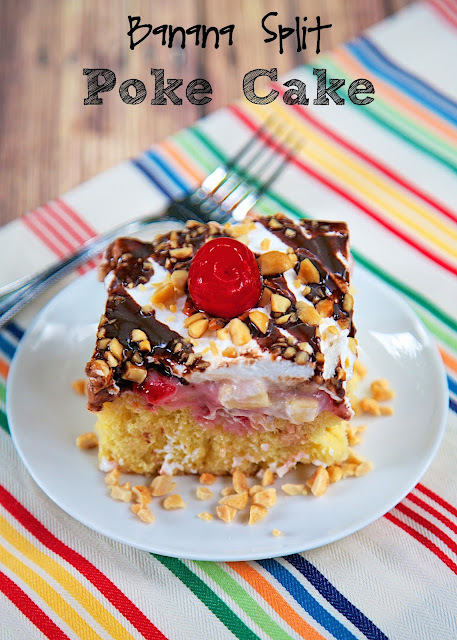 Banana Split Poke Cake Recipe - all the flavors of a banana split in cake form! Yellow cake with pineapple. 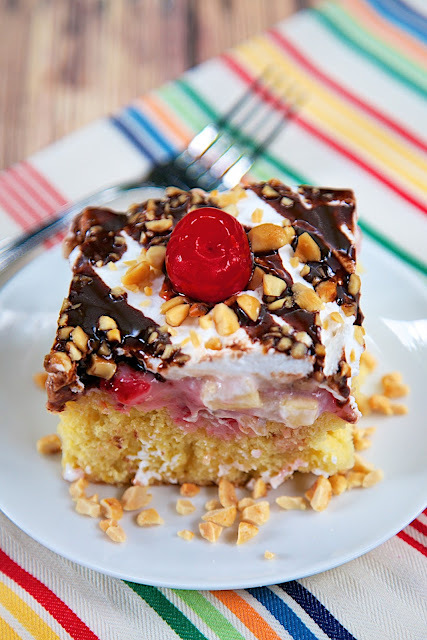 strawberry ice cream topping, bananas, Cool Whip, chocolate syrup, peanuts and cherries. Can be made several days in advance. Great for a potluck! Do you like poke cakes? I love poke cakes! They are so easy to make and they can be made several days in advance. This Banana Split Poke Cake has all the flavors of a banana split in cake form. It is YUM-O! I used a box of yellow cake mix and added pineapple to the batter. I used some strawberry ice cream topping for the poke layer. I topped everything with bananas, Cool Whip, chocolate syrup, peanuts and cherries. It was crazy good. The cake lasts for several days, and it actually tastes better as it sits. This cake would be great for a summer party. It is great for a crowd and very convenient since it can be made in advance. A quick note on the cake - I only used two large bananas on the cake. They covered the cake without overlapping. That was Chicken Legs' preference. If you are a banana lover, you will want to double up on the bananas. Prepare cake according to package directions. Stir in crushed pineapple. Pour batter into a lightly greased 9x13-inch pan. Bake according to package directions. While cake is baking, stir together strawberry ice cream topping and sweetened condensed milk. Set aside. Remove cake from oven. Poke holes all over cake with the handle of a wooden spoon. Pour strawberry mixture over cake. Cool completely. Place sliced bananas on top of cake. Spread Cool-Whip over bananas. Drizzle chocolate syrup over Cool Whip. Sprinkle chopped peanuts on top of cake and place cherries on top. Love the cherry on top - so perfect! But, I have never done a poke-cake... is this a southern thing??? I don't think it is a Southern thing, but I could be wrong. Either way, it is delicious!